...the launch of Ruby Loves! 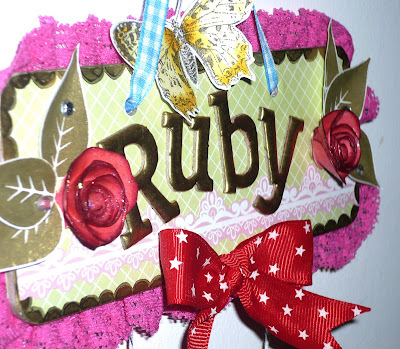 A gorgeous girly door plaque! 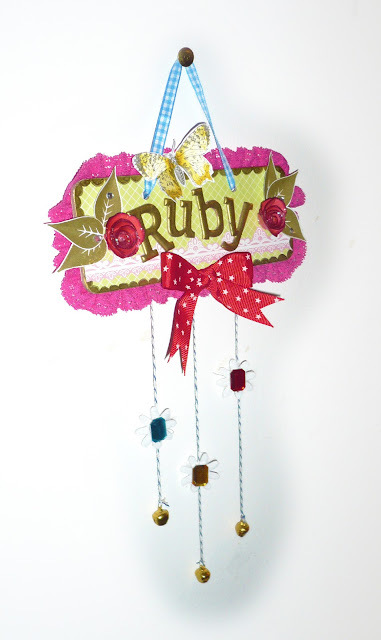 I made this for the new Ruby Loves magazine! Normally I never mix business with pleasure here on my blog, but fate has made these paths cross and kind of become one for the moment. As you may have noticed, according to my profile I am actually a magazine/graphic designer to trade and for quite sometime I have been beavering away at work with my colleagues, helping to make this project become real and yay - we launched nationally on Wed 27th March there. It's been a busy old time preparing crafty bits and pieces at home and inventing a style/identity for Ruby at work, but one thing I know is that creativity encourages more creativity and sometimes when you're on a roll, the inspiration just flows. So, she's out there as of now and she is a thing of beauty (well, I think she is and I hope you agree)! Her mission is to get everyone crafting, baking, being creative - especially mums with young daughters like myself, spending time together, not only making and sharing crafty goodies but memories too. Here's a link to the website - you could pop by for a nosey to see what Ruby Loves. 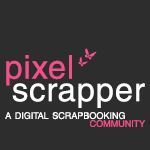 This post isn't meant to be an ad - just sharing the joy of crafting! I hope you'll love Ruby too!